If your house is anything like mine, the combination of the heat and the long summer days is taking a toll on pretty much everyone. A recent trip to my uncle’s farm left me with a giant box of pool noodles I didn’t have a need for, but now I think I know the perfect project. So here’s a great, EASY, backyard DIY using pool noodles that should get the kids up and moving both in the build and once it’s complete. 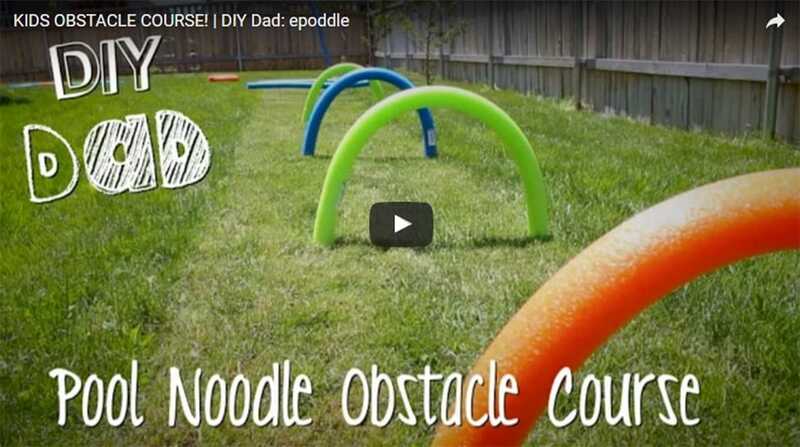 I think you could really take this a step or two further right out of the gate — hand your kids some construction paper and pencils and have them design their ultimate obstacle course, then have them figure out how to translate that in pool noodles and other dollar store outdoor summer items. You could really teach your kids quite a lot about properly executing a DIY project this way, from the planning stages, to budgeting, to implementation, and finally, the build. The more the kids are involved in a process like this, the more proud of the outcome they’ll be when they get to show it off to their friends and neighbors (or maybe just the family dog). And as long as you use items meant to be outdoors (and therefore withstand a light amount of weather and wear and tear) you could leave the course up for a few days, leaving time and space for reconfiguration, upgrades, and the inevitable demolition. This idea would be great for a birthday party or barbeque or just a fun family event. Better yet, add a water element like a baby pool or a sprinkler for the kids to jump through, or the obvious choice of a slip and slide, and you’ll have hours of outside fun to beat the heat and give you some peace (or at least the illusion of it).